Majority of the iOS users has a doubt in their mind: can they Zip their files and documents on their iPhone? 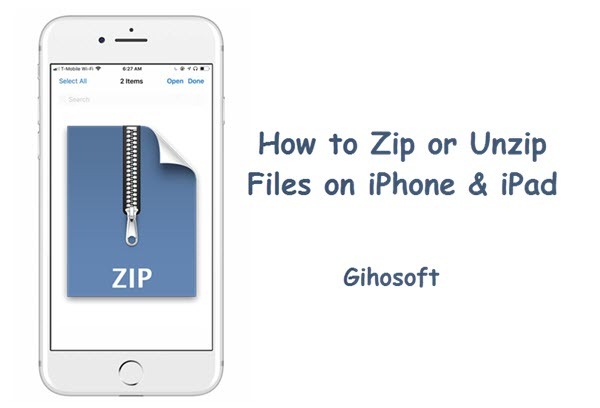 Today in this article we will tell you about the steps and instruction related to the Zipping of files on iPhone and iPad. Zip/rar archive files are a good way to save space and manage documents on iPhone, which we use commonly on computer long before the birth of iOS. The ‘Zip’ oginally is refer to the name extension ‘.zip’ or ‘.zipx’, one kind of compressed file format like ‘Rar’. It allows you to put one or more than one files in a single folder then to be compressed as a whole. This method will also reduce the total size of the files, and that is why it’s so popular on iPhone since the iOS device doesn’t allow any insert for extra memory. To zip files on iOS device, an zip or rar app will need to be installed so as to achieve our target. Now we will recommend you some good iOS zip apps, as well as the steps to create and open zip/rar files on iPhone or iPad. There are several popular zip or rar apps avaliable on App Store for iPhone to help you compress or open the zip or rar files. Each of them can be used to Zip or unzip files on iOS. They will occupy a very less storage space in your phone so you don’t need not worry about that. You can import all your files and documents at one place with an ease using one of these tools. Some of them even have the capacity of media playing and file management. 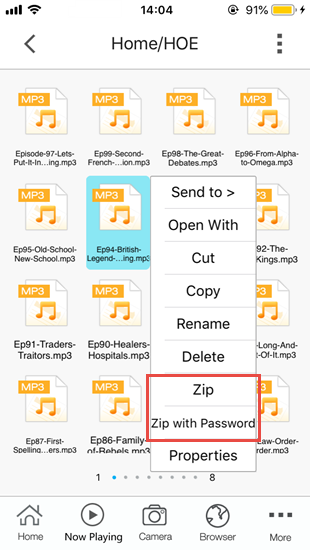 The steps to compress files on iPhone or iPad are similar with any of the zip apps mentioned above. Now below are all these detail steps for you to easily compress or unzip the zip files on iOS device. Download and install one of those zip apps on iPhone from App Store. If the files are not on your iPhone yet, then download the files to iPhone through cellular data or WiFi by Dropbox app or other file transfer apps. Long tap or open the file to reach the share button. After that you will see the Zip tool icon appearing as an option to share; choose it. Then your files will be directly uploaded on the zip app. Then long press on the file, or click the three-dot in the corner of the file icon (depends on the zip app you use), you will see the ‘Zip’ option on the drop-down menu. You can either directly zip the file or choose to zip with password. If you want to zip several files as a whole, you need to transfer the files to the zip app first one by one, then you can make folders for files inside the app according to your choices and needs, and you just need to compress the folders. Done. Make sure you have one of those zip apps on your iPhone or iPad. Then transfer the zip file to the iOS zip app, and better move it to a new folder if the zip file contains lots of documents. Just tap on the file to open the zip file; if it asks for password, then get the correct password and enter it. The zip app will automatically unzip the files and release everything inside. We hope that you will now be able to create zip or rar files as well as unrar files on your iPhone. Zipping or unzipping files was not and never should be a tough task on iPhone for people. And with zipping, you can easily save your value space, and even secure your files with passwords. Just in case if you find any query then please let us know in the comment section so that we can resolve it as soon as we see. Also welcome any other good suggestion to share with us. To get more other using tips for iOS devices, please refer to our resource ‘iPhone Tips’.